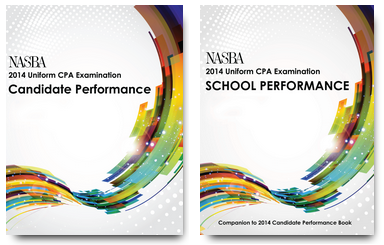 NASBA has released two volumes of data on the CPA Exam in 2014. The 2014 Uniform CPA Examination Candidate Performance Book features comprehensive statistics on how candidates performed in all four testing windows of the Uniform CPA Examination in 2014. The 2014 Uniform CPA Examination School Performance Book features extensive data on educational institutions, allowing for easy comparison of their students’ testing competency among categories such as program size, state/region, and student nationality. The data reported in both volumes is proprietary to NASBA, which coordinates all CPA Exam testing and houses scores, academic records, and demographic information for each candidate. “We encourage accounting programs across the U.S. to use the publications’ findings as a benchmark for success,” said James Suh, NASBA’s Director of Continuous Improvement & Analytics. Through analysis of the books’ national data, institutions can compare their school’s overall performance against others, professors can measure the effectiveness of their accounting programs, corporate recruiters can develop pipelines of talent, and students interested in enrolling in an accounting program can see which ones rank the best. NASBA first began gathering data on CPA Exam candidates in 1982 and has published reports on performance and selected characteristics since 1985. These improvement efforts represent a continuation of NASBA’s ongoing role as a reliable and trusted resource to the accounting profession. “By supplying data and analysis regarding candidate performance, NASBA helps both schools and the accounting profession by assisting in the development of successful accounting graduates and future CPAs,” said University of Baltimore Professor Greg Gaynor. Both volumes are available for purchase through NASBA’s website. The 2014 Uniform CPA Examination Candidate Performance Book is available for purchase, in both softback ($150) and eBook ($100) versions. Please visit NASBAreport.com to learn more about the publication and to place an order. A complimentary copy of the 2014 Examination Summary Report is also available. The School Performance Book (softback version) is now available for $250. The eBook version (available in two weeks), sells for $200. Click the following links to purchase the latest edition, and preview the comprehensive school listing and free 2014 sample data report. Questions regarding NASBA’s reports and products on candidate performance should be directed to Matthew Wilkins, Product Manager for The NASBA Report: mwilkins@nasba.org or (615) 312-3806.